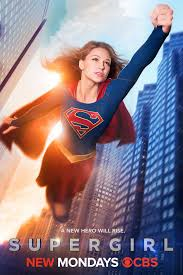 Supergirl (CBS) Rated TV-PG | What to Watch. The adventures Supergirl, cousin of Superman, as she navigates her own career as a super-heroine. Starring Melissa Benoist, Mehcad Brooks, Chyler Leigh, Jeremy Jordan, David Harewood, Calista Flockhart. Just like her cousin, and in the spirit of DC Comics’ Superman, Supergirl is every bit as honorable and appealing as her counterpart. With the same flare and desire to promote justice and save the world that Superman offered, this show is a refreshing change of pace from the more recent, cynical superhero movies. What isn’t so appealing is the excessive promotion of the feminist movement which gets old super fast. Even so, I found myself on the edge of my seat, especially in anticipation of a hopeful meeting between Supergirl and Superman. This show has everything that made us love Superman; how can we not love Supergirl too? This show is worth a watch. This entry was posted in 2015, action, Adventure, CBS, Rated TV-PG, reviews, Sci-fi, Tv shows and tagged adventure, Calista Flockhart, Career, cbs, Chyler Leigh, cousin, David Harewood, DC, feminist, hero, Jeremy Jordan, love, lunch, Mehcad Brooks, Melissa Benoist, movement, movies, seat, supergirl, Superman, trailer, TV series, tv show, Tv shows, world, worth. Bookmark the permalink. Pingback: People’s Choice Award Winners 2016 | What to Watch. Pingback: New Fall TV Shows 2015 | What to Watch. Pingback: New This Week on DVD, August 22, 2017 | What to Watch. Pingback: New This Week on DVD, August 9, 2016 | What to Watch.